Thanksgiving is, in large part, about celebrating food. Right? Well, that was the intention, anyway. Now, fearful conversations about food often overshadow the familial conversations over food. Thanksgiving is a time to be careful, not carefree. Turkey is the judge, jello is the jury, and Monday’s weigh-in is the executioner. Our new holiday ritual – much like the collective food conversation at large – is warped. We’ve got it all wrong. And fixing it would make the US, and the world, a healthier place. On the scale of bad/unwanted things, gaining five pounds is on par with smallpox. The average time it takes to gain or lose 10-20 pounds is roughly one week. 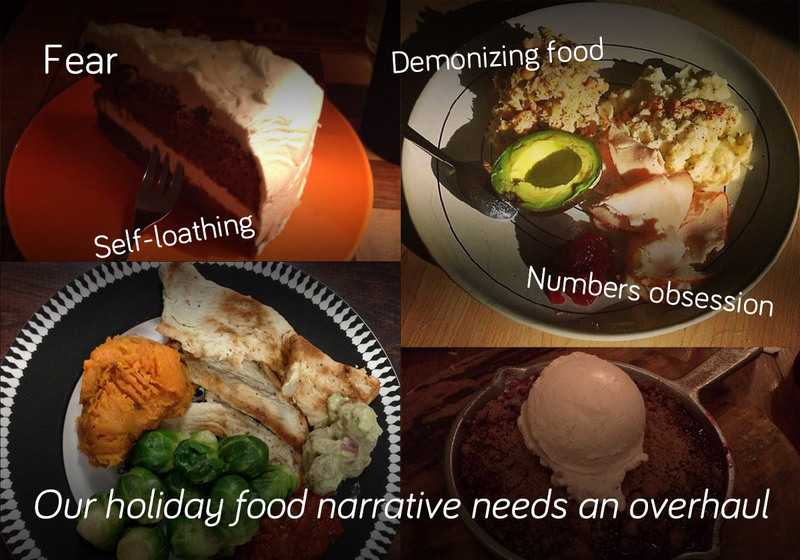 Holidays are the absolute enemy and we should probably just avoid celebrating them altogether. Crashes, cleanses, bloating, ballooning, expunging, inhaling, losing, winning – these are the words we frequently associate with weight management. The weight loss industry – and associated media – thrives on the quick fix, on hyperbole, on fear. The alternative – “Form strong habits, be cognizant of your weaknesses, lean on others for support and inspiration, and know that we all indulge sometimes” – is a boring message. What will that sell? Can we appreciate that headline for a moment? Forty seven? A headline that read “Savor Thanksgiving, but you’re f***ed” would sure save some newsprint. Let’s revisit the opposite, boring narrative for a minute: Forming solid habits, making steady progress, building a solid foundation of support. Viewing your mission as “improving your routine” rather than going on a diet, and treating it as a lifelong journey. It sounds funny, doesn’t it? But why are we laughing? We’re laughing because it’s so far removed from what we’re used to hearing. We’re used to January meaning New Year’s resolution tips and February meaning Valentine’s Day chocolate management. We’re used to May meaning two-week bikini cleanses and July meaning Bud Light Lime damage control. What we’re not used to hearing is the idea that every day of every month can be viewed pretty much the same, and that it’s almost certainly healthier to do so. Keeping with the same good habits, following the routine you’ve sculpted over time, allowing yourself some indulgence but not overdoing it – this stuff stands the test of time. We hear groans about the litany of Thanksgiving temptations, but is it that different from your every day life? When are we not faced with the choice to eat poorly? When we go to the grocery store, we make hundreds of small decisions that seriously impact our health for the rest of that week. When we eat at a restaurant, we typically stare at a menu featuring dishes spread across a 1,500-calorie spectrum. And when we open the fridge at 9 p.m. on a Wednesday, we see apples on one shelf and apple pie on another. Saying the holidays feature too much temptation strips us of our own agency. It diminishes our decision-making power. It cedes the narrative to people who tell us we need a 47th tip in our back pocket in case the first 46 don’t work out. This Thanksgiving, let’s not craft a plan to make it through the next five weeks alive, belt notches unchanged. Instead, let’s craft a plan to add 10 more Thanksgivings onto the end of our lives. It’s time to reframe the food intake discussion. We built TwoGrand (iPhone, Android) to change the health narrative. Our tagline is “No more diets.” We aim to help you reach and maintain your weight goal, and we don’t see that as a contradiction to our tagline. For positive changes to stick, your existing routine – no matter how much (or how little) you weigh – should be the foundation of your improved routine going forward. That’s our philosophy. That routine should probably include a little turkey on Thursday. And maybe some of your mom’s pumpkin pie. After all, Thanksgiving is, in large part, about celebrating food. Right? This entry was posted in Health and weight loss, Seasonal food themes, The TwoGrand philosophy and tagged Diet, dieting, Food, Health, healthy, healthy eating, holidays, huffington post, LA times, nutrition, thanksgiving, turkey, twogrand. Bookmark the permalink.